Shanghai Swans have thrown the gauntlet down to the rest of the GCL teams by extending their Championship lead by 25 points today in Mexico City. Daniel Deusser with Calisto Blue and Peder Fredricson with H&M Christian K took a convincing win in the picturesque grass arena, with new star striker signing Peder immediately proving his worth for the squad. 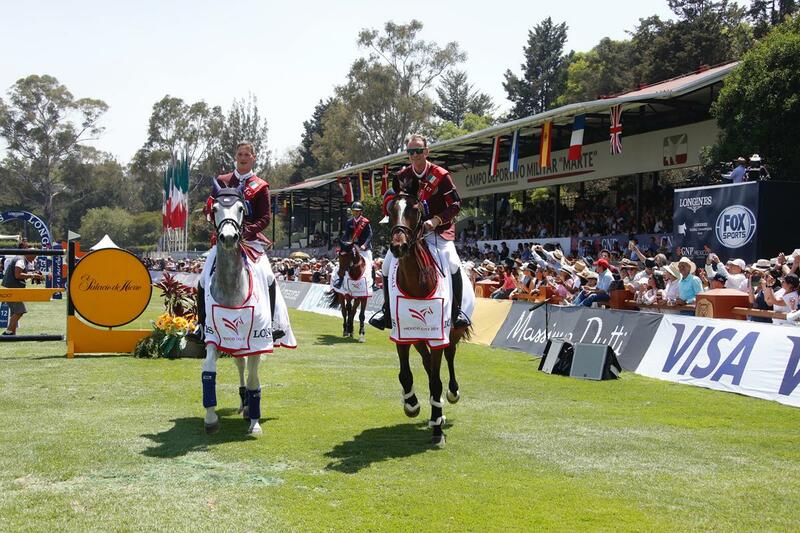 Thousands of fans flocked to the brilliant Mexican arena to see the GCL showdown unfold today, and the teams did not disappoint in a spell-binding display of edge-of-the-seat sport. Course designer Javier Trenor put together another flowing but challenging course, with options of lines for riders, and galloping distances requiring complete control, trust and precision. Athletes tackled a huge Massimo Dutto oxer, a Longines double combination, a GNP Seguros double combination, and a very skinny vertical set away from the in-gate caused a few problems. Gerco Schroder summed it up: “You have to pay attention at every second, the course does not allow you to take your eye of the ball.” Throughout the arena were eye-catching ‘Alebrijes’ – the brightly coloured Mexican folk art sculptures of fantastical animals adding flashes of brightness to today’s stage. With a heavy score of 14 carried over from Thursday, the Stars had everything to do today. First to go Jane Richard Philips and Clipper du Haut du Roy produced a brilliant clear, but picked up one time fault. Abdel Saïd and Venise du Reverdy matched their score perfectly, picking up one more time fault to keep the team on 16 overall. From one bird of prey to another, the Falcons looked determined to jump clear today. With no horse or rider change, Michael Whitaker and Strides Hilanasterne were first to take up the mantle, but got a little too close to the GC Prague Playoffs vertical, picking up another four faults for the team. 2018 Champions London Knights were keen for redemption today, with twin brothers Olivier and Nicola Philippaerts bringing out their top horses again for this round of action. Watched on by team manager Ben Maher, Olivier was first to go with H&M Extra. He delivered a foot perfect clear, putting the pressure on his brother Nicola and top stallion H&M Chilli Willi. The stallion looked fresh and fit, powering to the first two fences with his ears pricked. Nicola kept the horse together but an unlucky rub at the Longines combination and a pole at the Banorte vertical added another eight to the team’s sore, putting them on 12 overall. Fresh from his win yesterday, Pieter swapped mounts to Espoir, and the switch paid off – the Belgian rider finishing clear to keep the team on 10 faults overall. Bart Bles and Israel v.d.Dennehoeve had a moment at the start after his bay gelding spooked dramatically at the brightly coloured horse sculpture. But Bart managed to sooth his mount, and the pair pulled off a brilliant clear to keep the team on five faults. The GCL Super Cup winners looked in with a chance for a podium today, heading into the second round with a clear score. But a pole from Eric van der Vleuten and Wunschkind at the Longines combination would drop them to four faults overall. For full results, please click here. Press Conference audio available on request.